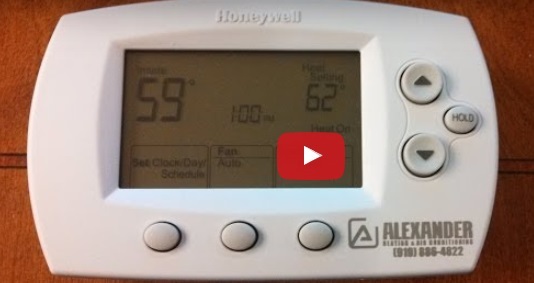 Selecting the correct thermostat for your system is very easy. You just have to know what to look for. This short video discusses the choices between a Furnace/AC Thermostat, a Heat Pump/AC Thermostat and a Programmable Thermostat. We install professional grade thermostats from Honeywell, as well as Jackson Systems, and others. I have heard many stories from customers who bought a thermostat from one of the hardware stores only to find that they are cheap, damaged, or malfunction right out of the box. Not to mention the confusion about will the thermostat work with their HVAC system set up. Alexander Heating and Air Conditioning can install and guarantee that your thermostat will function properly saving you time and money. Call Alexander Heating and Air Conditioning today!